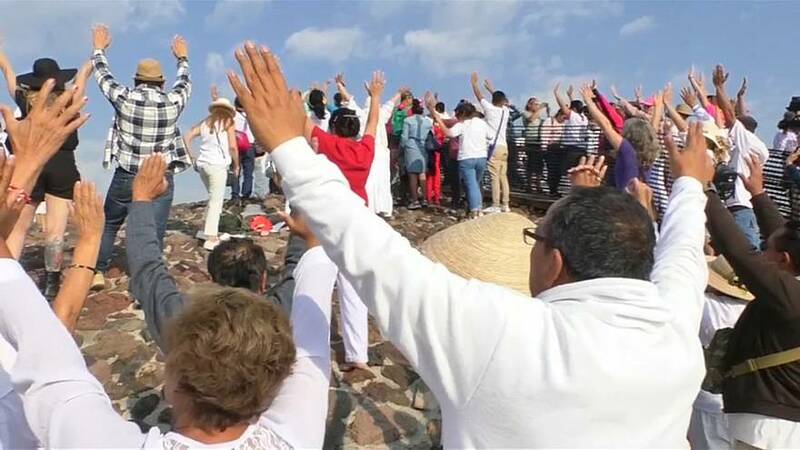 Hundreds of tourists and local residents, many dressed in white, climbed the towering Pyramid of the Sun in Mexico on Thursday to celebrate the Spring Equinox. The pyramids are located in Teotihuacan, a sprawling pre-Hispanic ghost town 50 kilometres (30 miles) north of Mexico City. Teotihuacan translates to "a place where men become gods." People from across the country and abroad make an annual pilgrimage to the ruins to celebrate the first day of spring, climbing the tallest structure, the Pyramid of the Sun, and throwing their arms towards the sky. The pilgrims believe the pyramids hold special energy during an equinox which can be passed to people, especially those who dress in white.